Selling 2 elegant evening handbags. All mid-20th century. Prices as listed below. Petite bag with Flapper Era/Art Deco vibe. 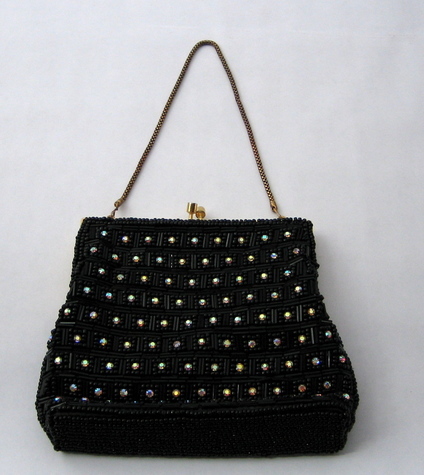 Exterior features hand-applied lustrous black seed beads and matte bugle beads surrounding rhinestone accents. Interior is black satin. Gold-tone frame with snap clasp and hide-away box chain. Stylish, sophisticated but not stuffy. Ideal accessory for a little black dress on a special night out. Dainty dress bag in ivory satin with hand-applied seed beads forming an abstract floral motif, accented with irridescent sequins. Gold-tone textured frame with egg-shaped snap clasp and chain handle. Ivory silk padded interior with pocket. Polished accessory for wedding, prom, or special evening out. Feminine but not fussy.